1. How secure will my scripts be? We use various techniques to protect your scripts. This includes, but is not limited to, bytecode encoding, an encryption layer and obfuscation - Techniques that we have learned through the years of protecting other programming languages (using SourceGuardian). Some of our techniques, for obvious reasons, are not documented outside of our core team and this is to provide a hightened level of protection for the Ruby or Ruby on Rails scripts. We would like to point out that we do not believe that we are uncrackable - No system is 100% foolproof, though we strive very hard to ensure that we are at the forefront of script protection. 2. 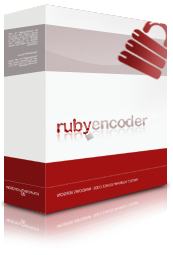 Does RubyEncoder include time limiting & IP/Domain locking? Yes, RubyEncoder can time limit scripts either as part of the application or via a license file which can be generated. We can also limit to IP address, domain name as well as MAC address. This is standard within our application. 3. Can I protect my Ruby on Rails application?